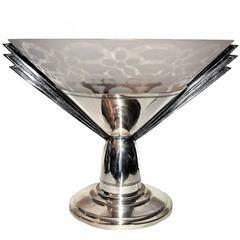 For your consideration is this exceptionally stylish modernist fruit bowl which dates to the 1930s and originates from France. The silver plate is in excellent condition and free from tarnishing and rubbing or scratches and is hallmarked to the handle. 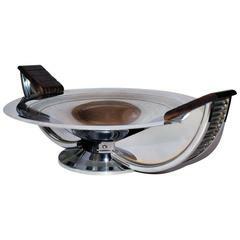 A cut glass liner rests in the top which is optional as it looks just as distinguished with or without. Macassar accented ball shaped handle. 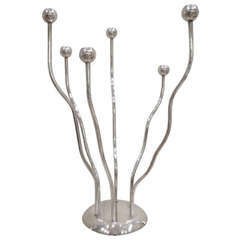 A silver plated candelabra designed and produced in Italy by Mesa. Stamped on the bottom. 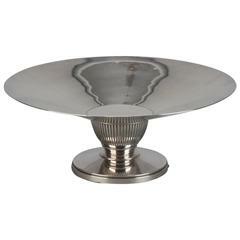 Found in England, this Mid-Century silver plate tazza has a Classic shape and finely reeded center support. 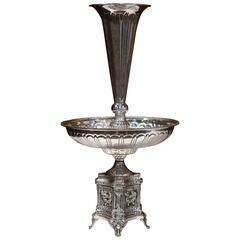 Vintage silver plate floral tableware centerpiece. The centerpiece is in excellent condition, maker's mark undersigned. The piece measure about 10 inches diameter x 5.5 inches high.